I commented that the writing process doesn’t occur so organically for everyone, to which she replied, “It’s really weird. It doesn’t take any blood… sweat or tears actually. It just comes to you, if you’re with your friends.” This chemistry is readily apparent on wax as the band is locked in throughout, with each member playing off their bandmates exceptionally well. The whole album flows smoothly and sounds quite crisp despite the heavily distorted tones employed. This album also features many guest performances. Bonnie said, “There’s like a dozen different people that have listened to music their whole lives” who “came together and recorded together” on the album. 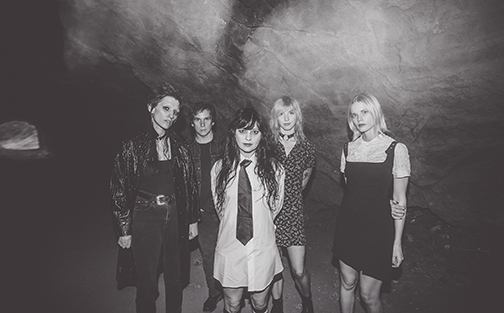 Catch Death Valley Girls on Nov. 15 at The Shakedown. For more information about the band, see www.facebook.com/DeathValleyGirls.